Before you start any formal sales negotiation training, you need to understand something that most salespeople just don't get. Whether you call it sales negotiation, handling objections or addressing concerns the same big problem remains. Most people aren't any good at sales negotiation because they're afraid to do it. Therefore all the sales negotiation training in the world isn't going to do you any good, because it doesn't address the underlying cause of the problem. Fear. So let's use a more effective approach. 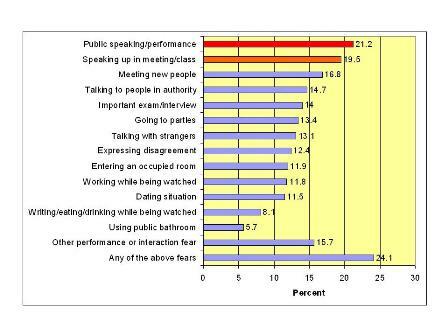 Take a look at this graph which comes from a large study of social fears in America. How many of these fears are potentially involved in a sales negotiation? I would say all of them except the two purely social ones of parties and dating. So if virtually all of the most common social fears are involved in sales negotiations that makes it a pretty scary activity for most people. That's exactly what you find when you talk to people in sales too. The scariest parts of the sales process (and therefore the parts that people put off until later) are prospecting and negotiating. What I've noticed in 9 years of sales, and training sales people, is that when you address one of these fears the others tend to improve dramatically as well. In particular, overcoming fear of public speaking in salespeople often results in them doing far better at the toughest parts of sales, ie prospecting for new business and handling objections. By all means enroll in some formal sales negotiation training or even better, get alongside an experienced mentor, and extract every last bit of wisdom from them. As you're doing that though make sure you address the underlying fears in a practical way by following these steps. You'd be a lot better at negotiating if you weren't afraid. You get the biggest bang for your buck by picking the biggest one... the fear of public speaking ... so it makes sense to start there. Remember it's absolutely useless to read a self help book and expect your fears to go away. That's why this site is based around the simple idea in this diagram. Do all three and watch what happens to your confidence and results in sales. This web-site and Toastmasters may be all you need. One of the main reasons I built this site around public speaking, rather than other aspects of fear, is that there's so much help readily available. If you really understand the articles, do the exercises on this site,and join Toastmasters - you'll never be afraid of any speaking assignment again - sales negotiations included.